BinaryOptionsNow – EZTrader was one of the earliest providers of binary options trading services. Ever since its inception in 2008, it has worked tirelessly to create an easy to use platform for trading binary options. Based in Cyprus, EZTrader has an experienced multilingual support team which is available for 24 hours on each of the weekdays to assist you in resolving any issue that you might be facing. Not only does the support team help you out with platform related issues, they are also well equipped to provide you with their inputs regarding trading strategies. GlobalOption is a Cyprus based company which offers binary option trading services to traders from all over the world. GlobalOption provides its customers with an award winning trading platform which removes all the complexity from binary options trading and makes it extremely fast and simple. GlobalOption has a team of Account Service Managers who are available to help clients out should the need ever arise. Both GlobalOption and EZTrader are operated by WGM Services Ltd. which is a company based in Cyprus. These companies allow their customers to trade binary options for a huge variety of assets which includes currency pairs, international stocks, indices and commodities. Unlike regular options which last for a month or more, binary options provided by EZTrader and GlobalOption have a shorter duration of anywhere from an hour to a day. This allows you to trade a lot more options for the same amount of money thereby increasing your profitability. As opposed to regular options which might require you to offer collateral, binary options offered by EZTrader and GlobalOption don’t require any kind of collateral. Given that your risk is limited to the amount you stake on a particular asset, binary options are a lot less risky than trading regular options or even the underlying security directly. The only drawback of binary options compared to regular American options is that while regular American options can be executed prior to their expiration time, binary options can only be executed at their expiration time. 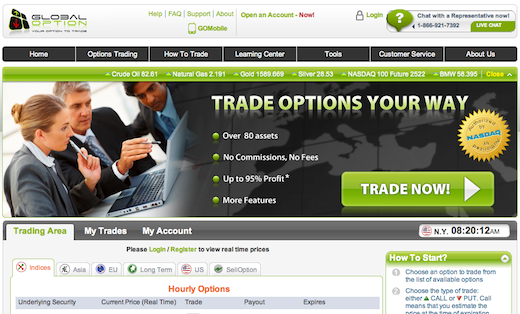 Both EZTrader and GlobalOption offer a state of the art, web based trading platform to trade binary options. The web based nature of the trading platforms ensures that you can access your account from anywhere in the world provided you have access to the internet. It also ensures that you get the latest and the most accurate quotes for the underlying asset. The trading platform has not only been well received by the clients of EZTrader and GlobalOption but has also received awards for the ground breaking features that it offers. Unlike most other binary options trading platforms, this trading platform allows you to sell the options that you might have bought earlier. This allows you to profit from favorable movements of the price of your chosen asset and lock in your profits. This is especially useful in cases when you would like to cut your losses on a particular trade that didn’t go in the direction you had anticipated. Instead of losing your entire stake, this feature allows you to sell the option back while it is still active and save some money. The payouts range anywhere from 70% to 80% of the amount you have traded. This means that if an option moves in the direction you anticipated, you can earn a 70% to 80% return on your investment in as less as an hour. On the other hand, if the trade doesn’t go in your favor, you can still receive up to 15% of your money back thereby reducing your loss. 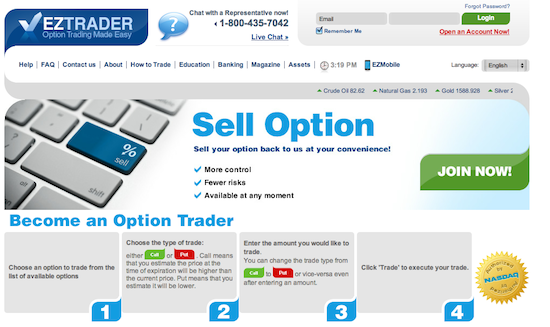 Both EZTrader and GlobalOption provide a variety of assets which you can trade binary options for. Tradable indices include the DIA (Dow Jones Industrial Average), FTSE and S&P 500. A variety of international stocks are also available should you prefer them. Both these platforms also allow trading in commodities like Gold, Silver and Crude Oil. Finally, these platforms allow option trading for currency pairs. Their websites contain exhaustive lists of all the assets available under the above mentioned category. It is important to note that binary options for currency pairs and commodities are available to everyone except to residents of the United States. WGM Services Ltd., the parent company of EZTrader and GlobalOption, has recently notified the CySEC (Cyprus Securities and Exchange Commission) of its intention to apply for a license which would classify it as a Cyprus Investment Firm and allow it to provide binary options trading services to its clients. Ever since CySEC made it mandatory for financial companies to obtain a license to continue offering binary options trading services, there has been a rush by companies to obtain the required license. Obtaining the license would implicitly make EZTrader and GlobalOption licensed providers of binary options trading services.